If the concrete floors in your commercial space are old, there is a good chance that voids and a general unevenness are starting to appear. Not only are these voids unsightly, but they also pose a threat to the functionality of your concrete floors. They are, therefore, something that should not be ignored. If you don’t fill in voids and perform concrete leveling and repairs, your concrete floors will fail to hold and will break and fall, which can potentially cause injuries. In today’s blog post, All West Surface Prep would like to share with you some information regarding concrete leveling. 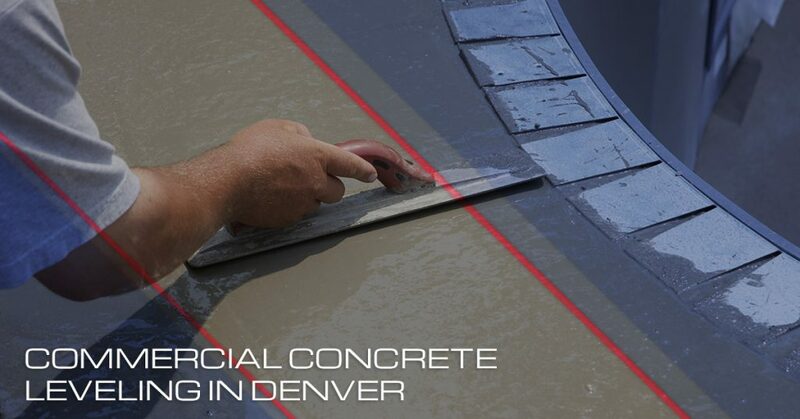 We are proud to be Denver’s go-to concrete flooring experts. If you are concerned about the safety of your floors, we’d be glad to inspect your space, explain any problems, and give you a free estimate for leveling your damaged concrete. Call us today at 303-573-7737 to get started. Although the weather is way more of an impact for exterior concrete, it can impact interior concrete floors as well. The flux between freezing and thawing causes slabs to heave or raise and then settle again — often to a new position. As you can image, over time this can result in shifting slabs. As scary as it is, the ground beneath us is almost always susceptible to erosion and shifting. Damaged water or sewage lines can cause erosion, which can then cause concrete slabs to crack, settle, and shift. Not all concrete flooring contractors are the same. Oftentimes, business owners and homeowners will opt for a less experienced contractor as a way of saving money. This can lead to poor installation, which can then lead to an unlevel floor. One common mistake made by contractors is slab curling. This occurs when a large section of concrete is poured and the top slab cures faster, causing the slab to curl and become unstable. Commercial floors and warehouses where heavy machinery is regularly used are more susceptible to damage. The vibration from the machinery can cause the base slabs to shift and settle. How Can You Fix Unlevel Concrete? Believe it or not, repairing old unlevel concrete surfaces doesn’t always require a full replacement. Concrete is remarkably durable, and there are many concrete resurfacing experts who can offer a more budget-friendly option. Oftentimes, this is the case for uneven floors. Fully restoring a commercial or industrial space can be quite an undertaking. Among the many difficult and labor-intensive tasks, concrete leveling and repairing ranks among the top. If you would like to transform your concrete floors, contact us today! The All West Surface Prep team has over 25 years of experience in concrete repair, grinding, leveling, surface prep, and more. On top of this, we are proud to carry some of the most powerful and accurate concrete leveling equipment in the Denver area. In fact, we are able to level floors of any size to a 1/32″ degree of accuracy. Whether you have a small concrete repair or a total concrete leveling job for us, when you partner with All West Surface Prep, you get a team who is committed to you. Not only will we be as prompt as possible and work within your scheduling needs, but we will also work with you to ensure that your concrete floors are perfect. This means they will enhance the appearance, function, and safety of your commercial space.